It has been an amazing year for all of us at Lichtsinn RV! With 2018 coming to an end and 2019 quickly approaching we wanted to look back at 2018 and share with you some of our favorite moments! WATCH OUR VIDEO OF OUR FAVORITE MOMENTS OF 2018 HERE. 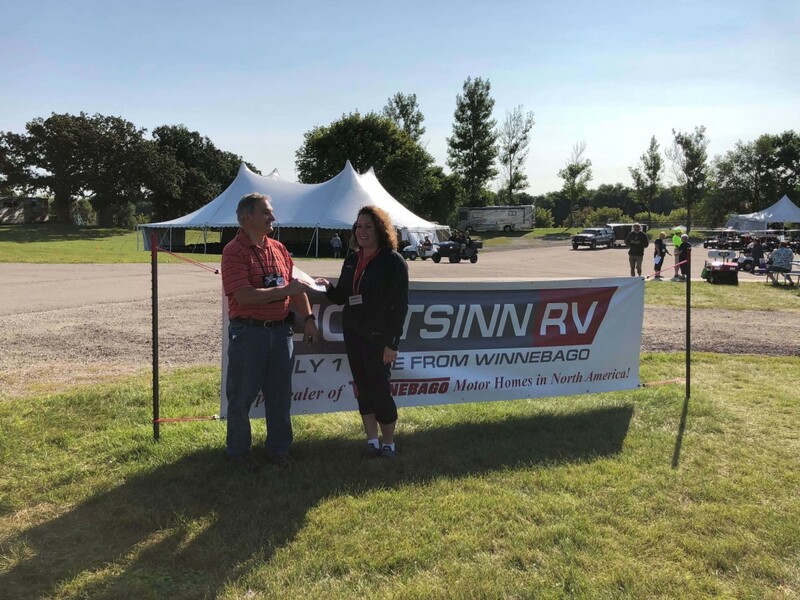 In 2018, Lichtsinn RV was recognized as the #1 Winnebago Dealer in North America for the 4th consecutive year by Winnebago Industries at the Winnebago Redefined Dealer meeting in San Diego, CA. Lichtsinn RV was also named the #1 dealer of Class B motorhomes, #1 dealer of class c motorhomes, a top 2 dealer for class a diesel motorhomes, and a top 5 dealer for class a gas in North America. Winnebago introduced a handful of new, exciting products from late 2017 through 2018. The first being the Winnebago Revel – a true 4×4, all-season RV perfect for getting off the beaten, next Winnebago introduced the Travato 59KL and 59GL with the Pure3 Lithium Energy Management System powered by Volta Systems. The Travato 59KL and 59GL is Winnebago’s first venture into lithium-powered RVs and it has been an exciting one. 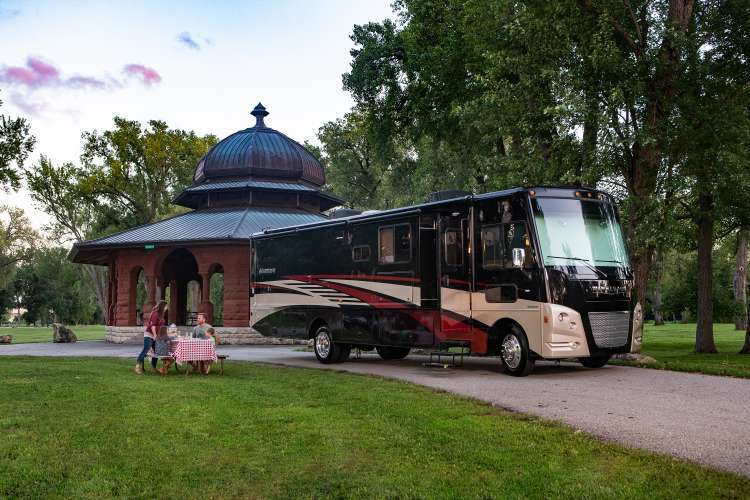 And at the end of 2018, Winnebago brought back the legendary Class A gas motorhome – the Adventurer. Lichtsinn RV is BACK at GNR! 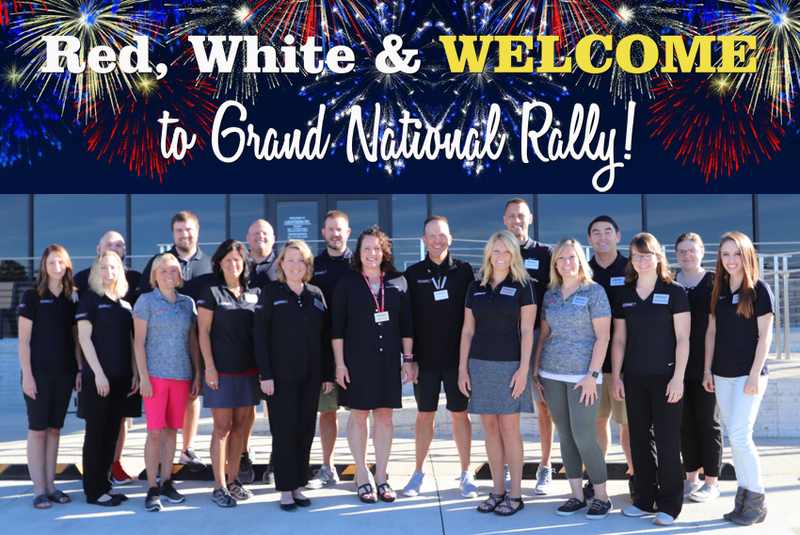 In July 2018, we were so excited to be back at WIT Club’s Grand National Rally! Our entire team had a great week seeing all the familiar faces and making new friends. 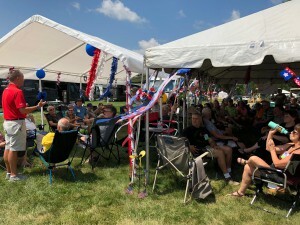 This year, we held a BBQ at the dealership and welcomed over 500 WIT Club members for an evening of food, fun, and fundraising games for the American Cancer Society. Behind the scenes of Going RV! Lights, Camera, and Lichtsinn RV! 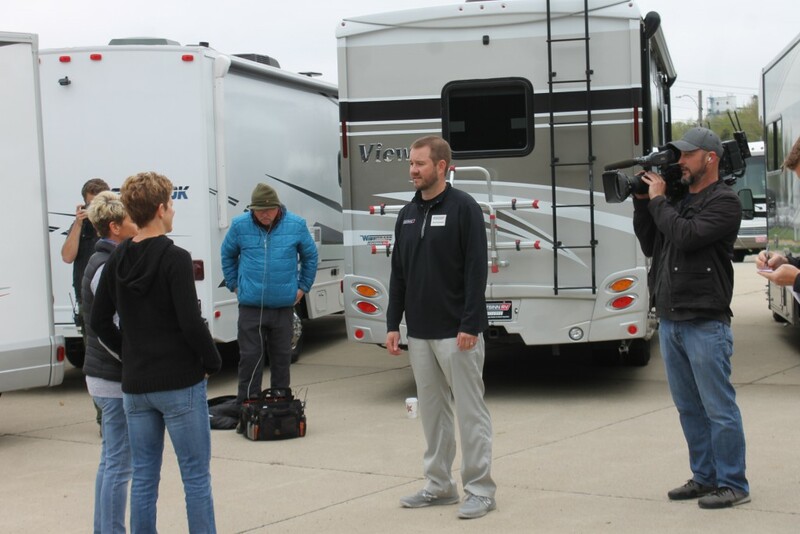 This year, we were fortunate to be featured on Great American Country’s Going RV – a national TV show exploring the RV buying process, RV Industry Publication RV Pro, and a new show debuting on Outside TV. We were also featured in state and local press. New additions to the Lichtsinn RV team and another renovation! The Lichtsinn RV team added 12 new members to the team in the sales, finishing, and service departments. With our additional staff, we remodeled our building again, adding additional offices for the new members of the Lichtsinn RV team! 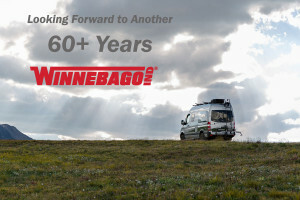 Happy 60th Anniversary to Winnebago. 2018 was the 60th anniversary of Winnebago Industries, and as a trusted Winnebago dealer for over 40 years we were excited to help celebrate this momentous occasion. 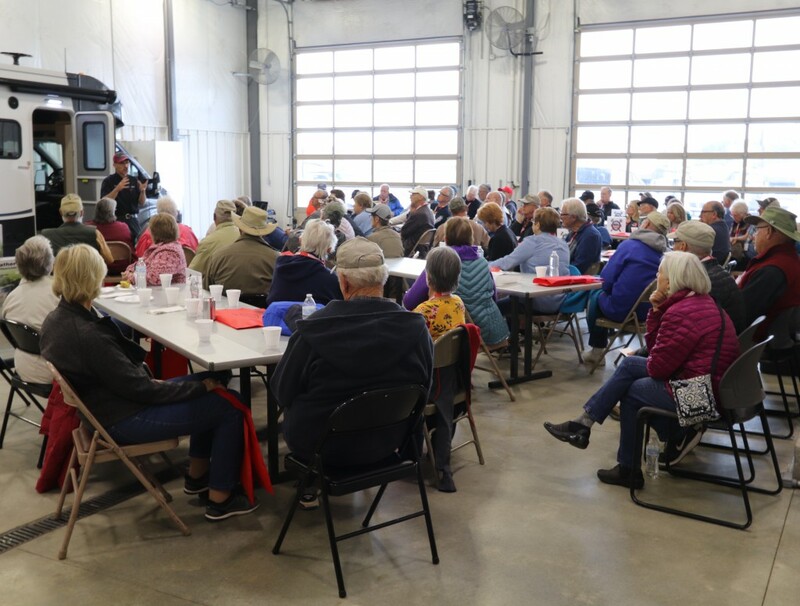 Forest City welcomed the Skinnie Winnie and Fuse owner’s group to town for their annual rally in September. 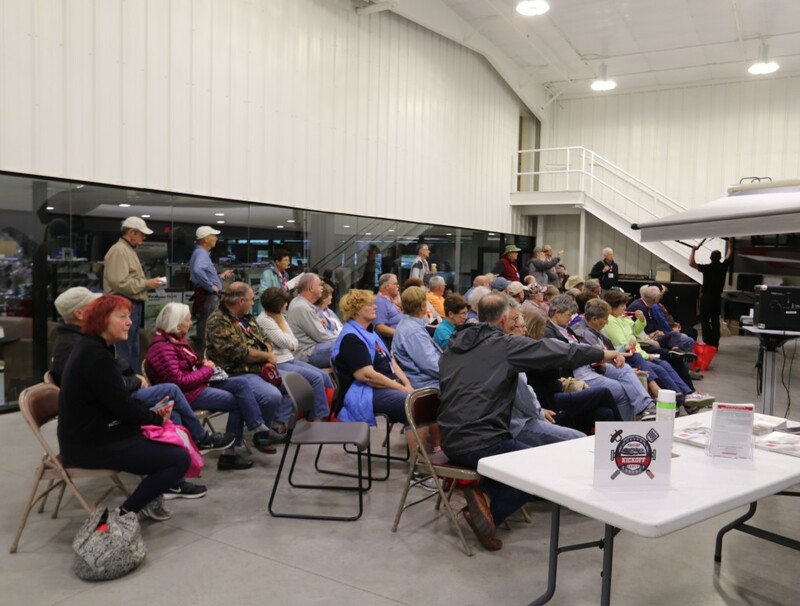 Lichtsinn RV kicked off the festivities with an entire day of educational and entertaining seminars, led by our RVDA Master Certified RV Technicians, about compact coach product, parts, and service tips. 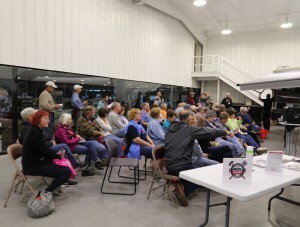 We entertained for nearly 200 Winnebago View, Navion, Via, Reyo, Trend, Viva, Fuse owners over the course of a day. In 2018, Lichtsinn RV continued to donate to various charitable causes through our We Care Charitable Giving Program. 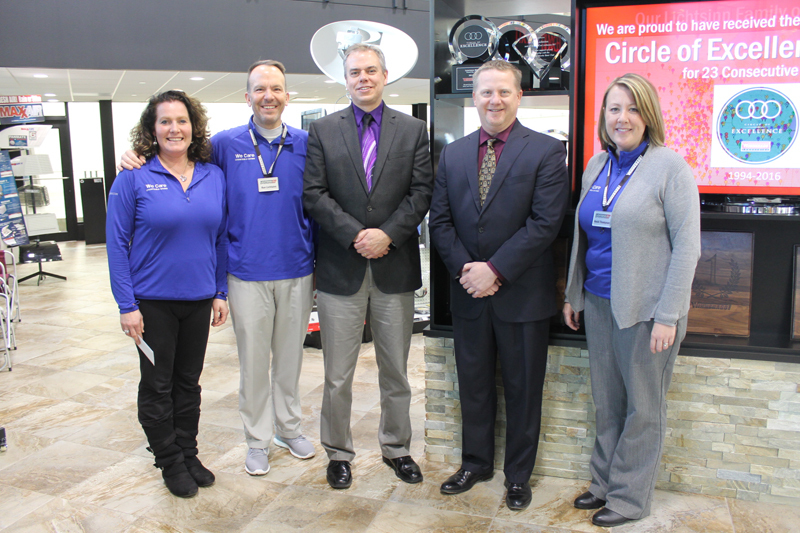 We continued to donate money to the Forest City School District, the Forest City Fire Department, Forest City Education Foundation, the American Cancer Society, and the Forest City YMCA. 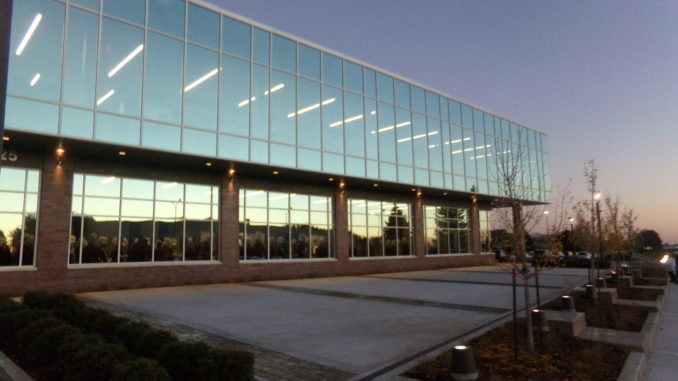 In 2016, Lichtsinn RV donated to the fund to build the Boman Fine Arts Center in Forest City, and in late 2018 the center held its grand opening. In October, Hurricane Florence devastated the Carolinas, and after the hurricane subsided, Gayle a Lichtsinn RV guest loaded her new Revel with supplies to assist in the cleanup. The team at Lichtsinn RV brought in various supplies to send with Gayle to provide relief. It is the season for giving at Lichtsinn RV, and in the month of December members of the Lichtsinn RV team donated Christmas gifts to over 20 kids through the local giving tree program. 2018 was a year filled with amazing moments for Lichtsinn RV and all our team members. We want to thank all our guests who helped make this year a very special one and we look forward to what 2019 brings! Members of the Lichtsinn RV team were in attendance at the Boman Fine Arts Center Grand Opening held on Monday, October 15th. Lichtsinn RV is a Diamond Sponsor of the Boman Fine Arts Center. 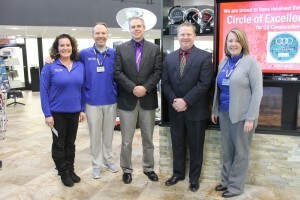 Pictured left to right: Hope Lichtsinn, Owner; Ron Lichtsinn, Owner; Bob Alsop, President Waldorf University; Darwin Lehman, Forest City School District Superintendent; and Heidi Thompson, Lichtsinn RV Vice President and General Manager. The center can host weddings, special occasions, theatrical performances, art displays, speaking engagements and regional/national touring groups. The center includes a 630-seat theater with an orchestra pit, green room, dressing rooms, staging and set production area, full fly area and rigging, along with state of the art electronics, lighting and audio visual equipment. Bowman Fine Arts Center in Forest City, Iowa. Photo courtesy of KIOW. “With this facility, the (Waldorf) choir, band, and theater will have a space to perform that reflects the history and quality of these ensembles,” Waldorf President Bob Alsop said. He also said Waldorf hosts “amazing artists and speakers” throughout the academic year in addition to its own performance ensembles. “I believe the community, who has always been welcomed at the events, will feel more encouraged to participate in these opportunities with this facility,” Alsop said. Forest City Superintendent Darwin Lehmann said the fine arts center will give students a suitable performance venue to showcase their talents. He said school concerts that have been held in gyms and cafeterias now can take place in a first-class auditorium. “What a way to enhance the experience” — not just for the students, but also the parents who come to watch, Lehmann said. He also said the new facility benefits the entire community, not just K-12 and Waldorf students. Forest City’s BrickStreet Theatre plans to hold its musical productions at the Boman Center, starting with “A Christmas Carol” in December. In addition to the auditorium, the complex features a main floor lobby and art gallery with seating for up to 120 people and an overall capacity of 250. 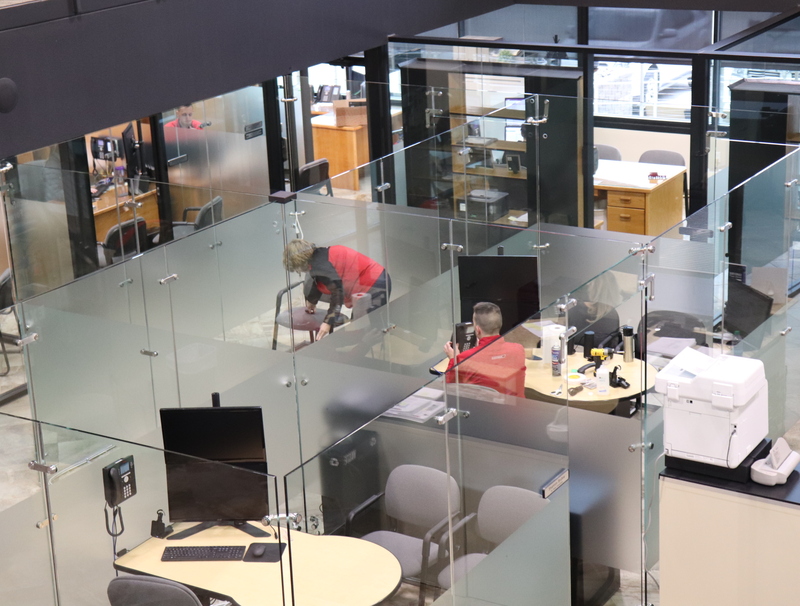 The upper level mezzanine has seating for 200 people with an overall capacity of 325, and features large glass windows with a view of the surrounding community.The grounds feature a 6,000 square-foot plaza, green space totaling 32,000 square feet, sidewalks and a parking lot. Lichtsinn RV will be featured on an upcoming episode of Going RV airing August 15 at 9:00 PM ET/8:00 PM CT on Great American Country. Going RV is a show about hard-working couples and families who decide to ditch ordinary daily life for an adventure out on the open road. 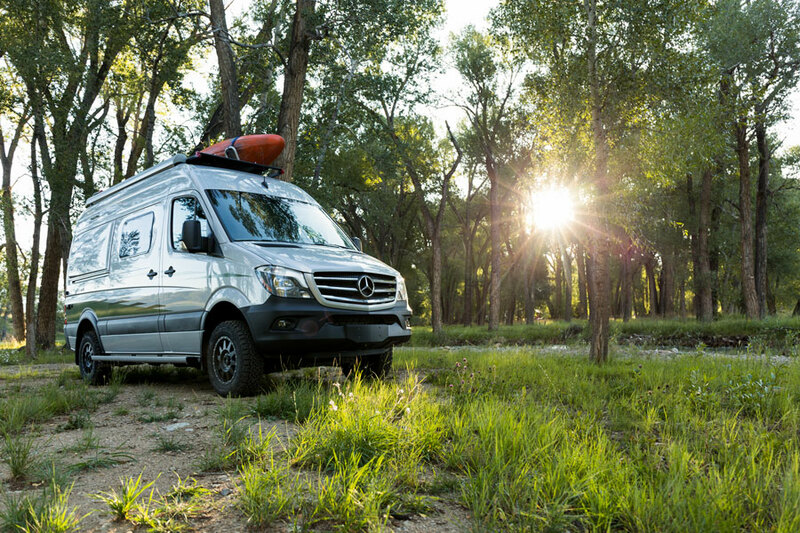 Take the ultimate ride as they go on a shopping trip to find their perfect RV. Whether it’s upgrading an existing motor home or going all out for a new one with all the bells and whistles, find out what happens when daring homeowners trade walls for wheels. 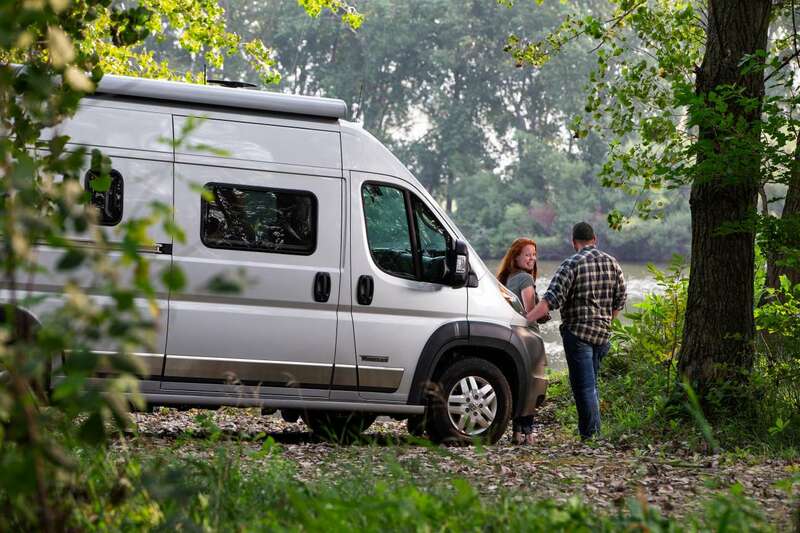 Several dealerships across the country have been featured on Going RV since it one of the few shows on television that focus on the RV lifestyle. 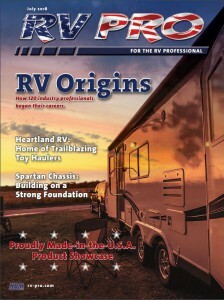 In fact, RVBusiness Magazine wrote a feature story on Going RV and Lichtsinn RV appeared in the article. You can read the article here. Lichtsinn RV will be featured on the 2018 season finale – Early Retirement in an RV. In this episode, Lichtsinn RV guests Ann and Lin have decided to retire early and hit the road to travel full-time in an RV. They’re looking for a Class A Diesel with plenty of room for their three dogs. Ann would like extra storage for their workout equipment, and Lin wants a washer and dryer. Lichtsinn RV Sales Consultant Reed Burkholder helps them find the perfect RV for their needs. Reed tours Ann and Lin through two Forzas and the all-new Winnebago Horizon. The Going RV crew arrived at Lichtsinn RV to unseasonably cool weather. 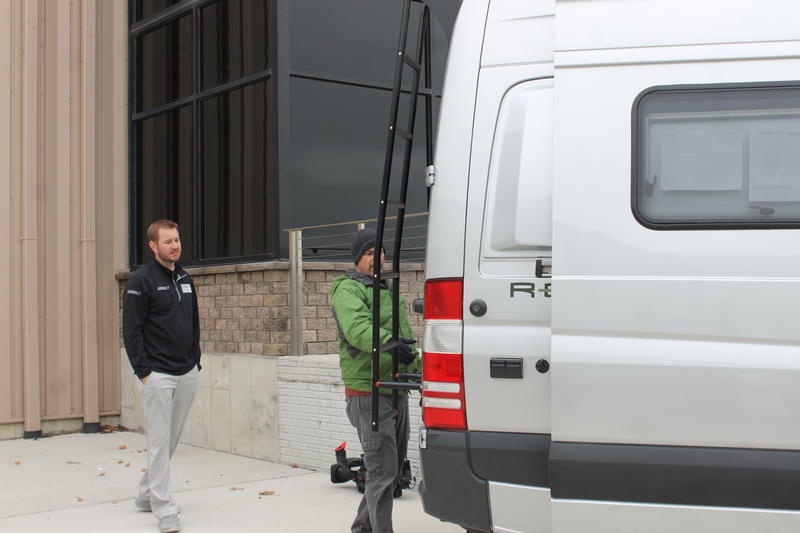 Shooting began early the next day with Lichtsinn RV Sales Consultant Reed Burkholder. Ann and Lin Check Out the Winnebago Horizon. Will the Horizon be the Perfect Home for Them? Ann and Lin Look at Another Forza with a Different Floorplan. 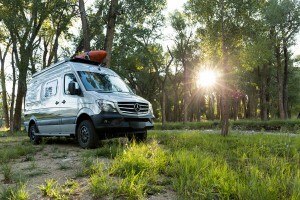 The Going RV Crew Takes a Break from Filming to Check Out the Winnebago Revel 4×4. Lichtsinn RV Sales Consultant Reed Burkholder Answers Ann and Lin’s Questions Before They Make Their RV Selection. Tune in to Great American Country on August 15 at 9:00 PM ET/8:00 PM CT to see which Winnebago they select. 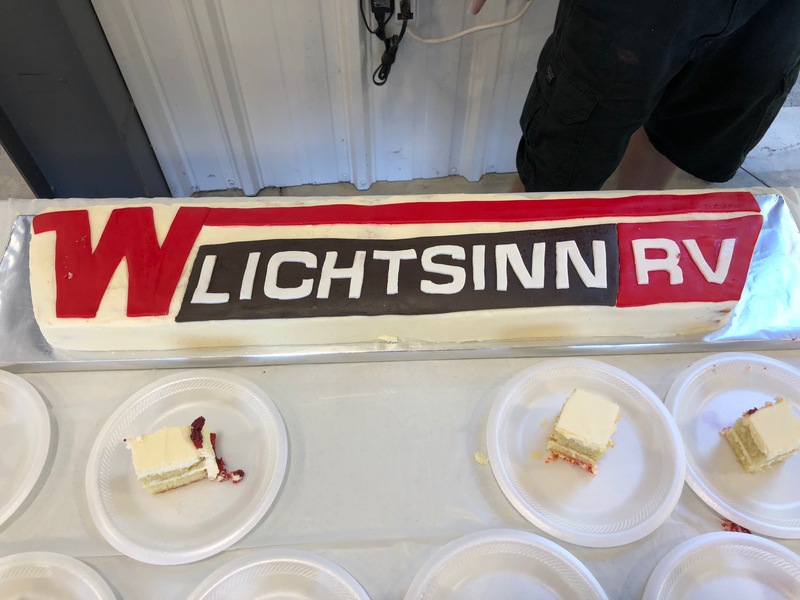 Lichtsinn RV Celebrates Winnebago Grand National Rally! 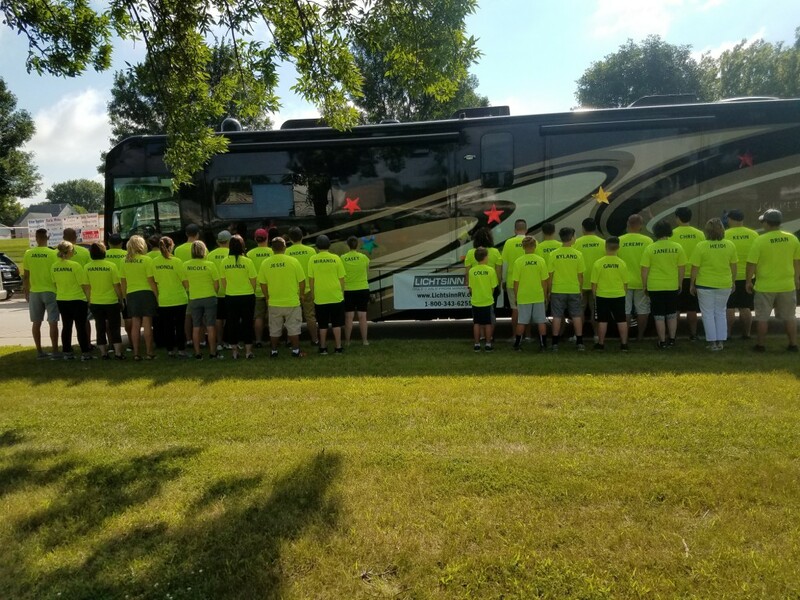 Lichtsinn RV had a jam-packed week July 20 – 27, 2018 for WIT Club’s Annual Grand National Rally in Forest City, IA. We chose a few of the highlights from the week to share. Battle of the Businesses – Lichtsinn RV competed in Forest City’s Puckerbrush Days’ Battle of the Businesses. This annual competition features local businesses competing against each other in wacky challenges for bragging rights. 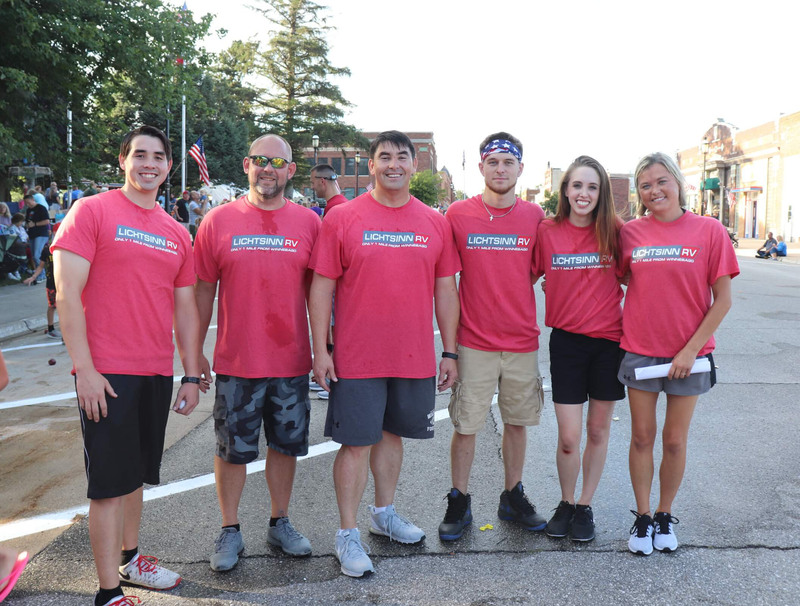 Lichtsinn RV’s Chris Stone (finishing department), Henry Stone (sales), Devin Richter (finishing department), Abby Durreger (sales), and Nicole Follman (sales) competed against teams from Winnebago Industries, TSB Bank, Mercy Family Clinic Forest City, Good Samaritan, and MBT Bank. The battle featured challenges like leap frog, a three-legged race, and corn shucking competition. Lichtsinn RV was in the lead the entire duration of the battle until the final challenge. Lichtsinn RV and MBT Bank competed in the final challenge and MBT barely pulled ahead to win the Battle of the Businesses. The Lichtsinn RV Battle of the Business Team – Chris Stone, Jeremy Gilbertson, Henry Stone, Devin Richter, Abby Duregger and Nicole Follman. 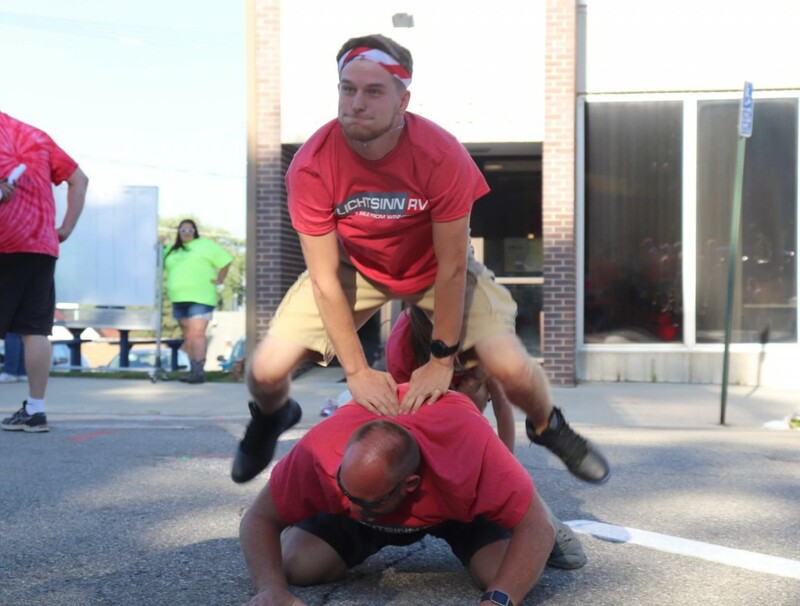 Devin Richter leap frogs over teammate Jeremy Gilbertson in the Battle of the Businesses Competition. 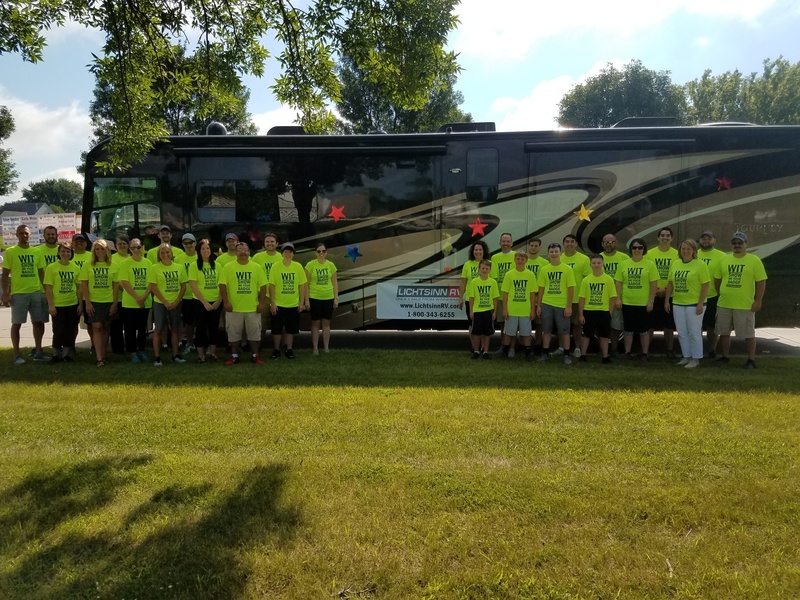 Puckerbrush Days Parade – On Saturday, the Lichtsinn RV team participated in the Puckerbrush Days Parade. We had quite the turn out with 5 motorhomes. Lichtsinn RV is ready to celebrate Puckerbrush Days! Lichtsinn RV employees showing off their bright yellow shirts for the Puckerbrush Days parade. 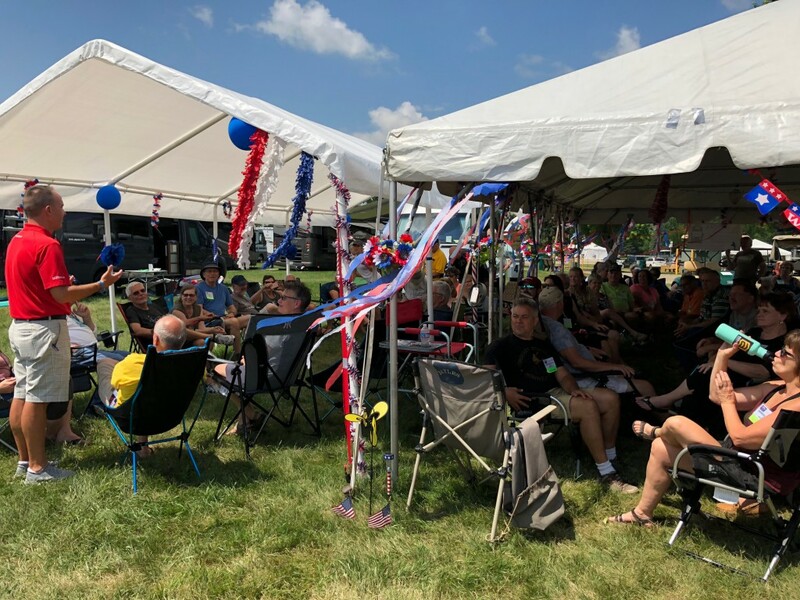 Red, White and Welcome to the Winnie Bs – Lichtsinn RV welcomed the Winnie B’s – a WIT Club special interest group focusing on Winnebago’s Class B (Travato, Paseo, Era and Revel products) owners. On the first day of WIT Club’s Grand National Rally we kicked off the week with a reception for the over 85 Winnie B’s. We were excited to see familiar faces in the group and meet new Travato owners! The Winnie Bs lineup for a tasty lunch from Lichtsinn RV. Ron Lichtsinn welcomes the Winnie B’s to Forest City and Grand National Rally. Red, White and Welcome BBQ at Lichtsinn RV – On Tuesday of GNR week, Lichtsinn RV invited GNR attendees back to the dealership for a BBQ with fundraising games for the American Cancer Society. 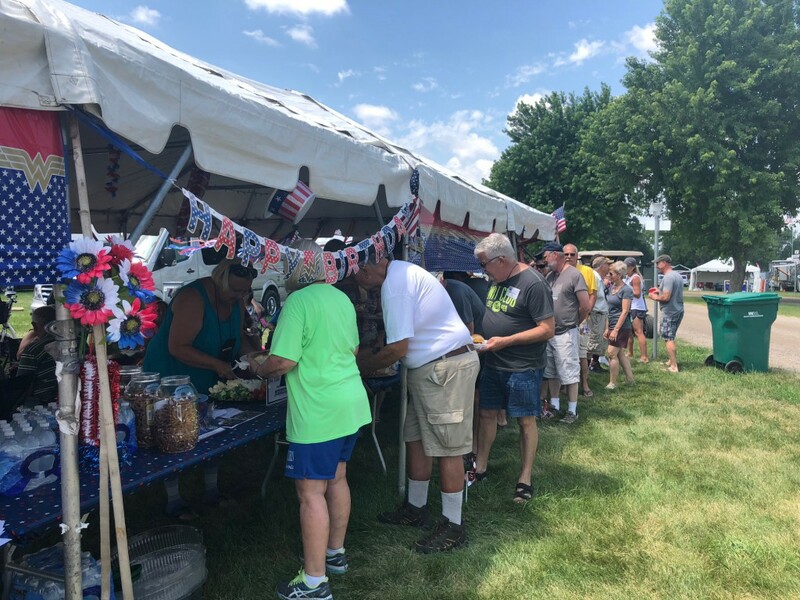 Members of the Lichtsinn RV team served pulled pork sandwiches and cake to our guests while others members helped with fundraising games like spin the wheel, bean bag toss, and plinko. We had over 550 attendees and raised $800 for the American Cancer Society. Our custom-made cake from Tiffany’s Sweets for the BBQ. 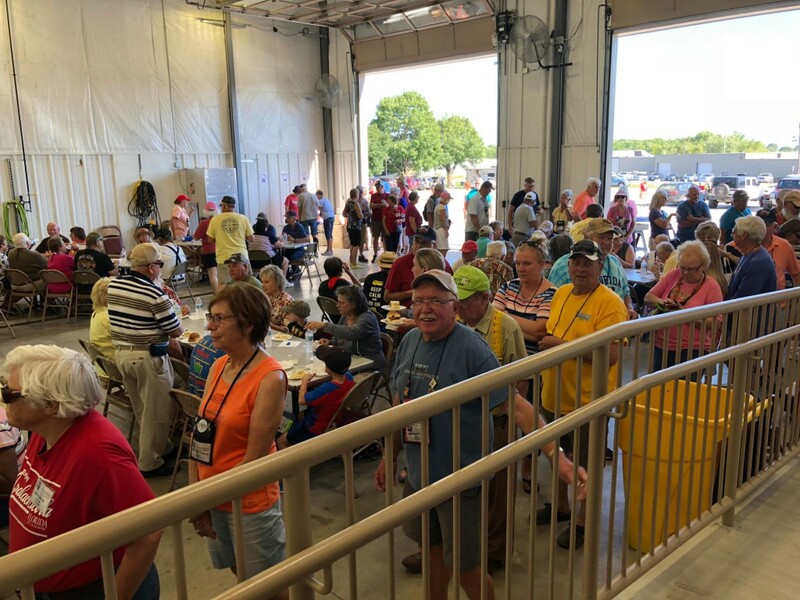 Over 500 people were in attendance at the Lichtsinn RV BBQ. Gas Grill Winner – Throughout the week, we collected over 800 entries to win a gas grill or $150 Lichtsinn RV Parts Gift Card. On Thursday we drew the winner, Randall Smischny from Kansas. Randy was very excited to win since he said he never wins anything. Hope Lichtsinn awards the Lichtsinn RV Parts gift certificate to Randall Smischny. We had an awesome Grand National Rally. Thanks to all of you who visited us in the display and in the dealership. We look forward to seeing you again next year! 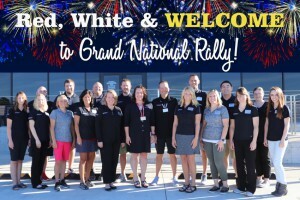 The Grand National Rally is an annual gathering and celebration of Winnebago RVs. Registration is open to all Winnebago brand RV owners in 2018! Attendees must arrive in a Winnebago brand product to register for and attend the event. The 2018 GNR – “Red, White, & W – 60 Years of an American Icon” – will take place Monday, July 23 – Saturday, July 28 in Forest City, IA. Pre-rally activities and pre-rally parking will be available beginning July 17. Lichtsinn RV is back at Grand National Rally in the product display. Look for the Lichtsinn RV Red and White Tent in the Dealer Product Display. The Lichtsinn RV Parts and Service Teams will be just 1 Mile away at the Dealership! See below for our full week of festivities. 6:30 PM – Join Lichtsinn RV at the Battle of the Businesses on Main Street in Forest City where we will be attempting to regain our title competing in various events for bragging rights with other local businesses. 10:00 AM – Join us at the Puckerbrush Parade in Downtown Forest City – we will be in the parade and handing out some great discounts to our WIT friends. Then join us back at the store to redeem your parade coupons and take advantage of some GNR Parts Specials. *WIT Club Members Receive a 10% Discount on all Winnebago, Itasca and Winnebago Touring Coach Parts. 6:30 PM – 8:30 PM – GNR Dealer Product Display Hours, Register to win a FREE Gas Grill. 9:00 AM – 4:00 PM – GNR Dealer Product Display Hours, Register to win a FREE Gas Grill. 5:30 PM – 7:30 PM – RED, WHITE & WELCOME BBQ at Lichtsinn RV – Just 1 Mile from Rally Grounds: RVs Are Open, Air Is On, Iowa Pulled Pork Sandwiches and Celebration Cake Will Be Served, Fundraising Games for The American Cancer Society. 9:00 AM – 4:00 PM – GNR Dealer Product Display Hours, Register to win a FREE Gas Grill (Register until 3:00). 4:00 PM – Gas Grill delivered to drawing winner. 9:00 AM – 3:00 PM – GNR Dealer Product Display Hours. 7:45 PM – 8:00 PM – Winnebago Farewell Sendoff. For more information on GNR click here. 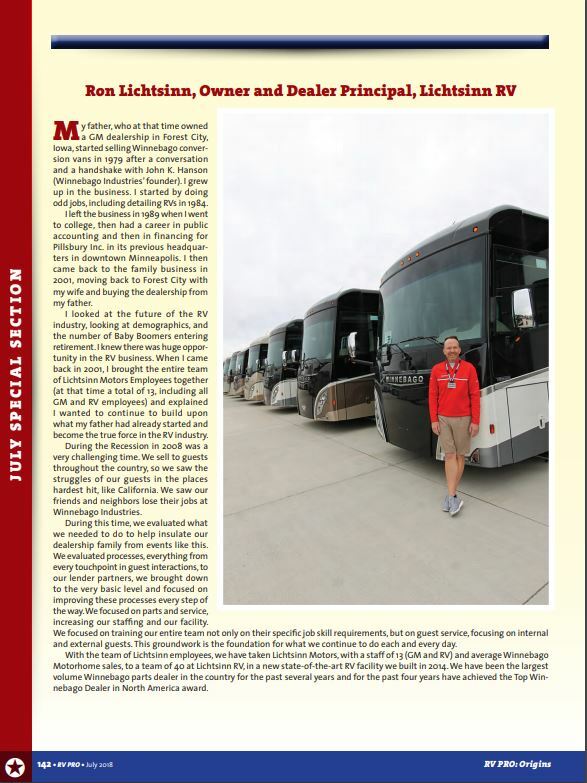 Ron Lichtsinn, Owner and Dealer Principal of Lichtsinn RV was featured in the July issue of RV Pro Magazine. The July special edition featured the “origins” of several professionals in the RV industry. You can see a digital copy of the issue here. My father, who at that time owned a GM dealership in Forest City, Iowa, started selling Winnebago conversion vans in 1979 after a conversation and a handshake with John K. Hanson (Winnebago Industries Founder). I grew up in the business. I started by doing odd jobs, including detailing RVs in 1984. I left the business in 1989 when I went to college, then had a career in public accounting and then in financing for Pillsbury Inc. in its previous headquarters in downtown Minneapolis. I then came back to the family business in 2001, moving back to Forest City with my wife and buying the dealership from my father. I looked at the future of the RV industry, looking at demographics, and the number of baby boomers entering retirement. I knew there was a huge opportunity in the RV business. When I came back in 2001, I brought the entire team of Lichtsinn Motor employees together (at that time, a total of 13 including GM and RV employees) and explained I wanted to continue to build upon what my father had already started and become the true force in the RV industry. During the recession in 2008 was a very challenging time. We sell to guests throughout the country, so we saw the struggles of our guests in the places hardest hit, like California. We saw our friends and neighbors lose their jobs at Winnebago Industries. During this time, we evaluated what we needed to do to help insulate dealership family from events like this. We evaluated processes, everything from every touch point in guest interactions to our lender partners, we brought down to the very basic level and focused on improving these processes every step of the way. We focused on parts and service, increasing our staffing and our facility. We focused on training our entire team not only on their specific job skill requirements, but on guest service, focusing on internal and external guests. This groundwork is the foundation for what we continue to do each and every day. 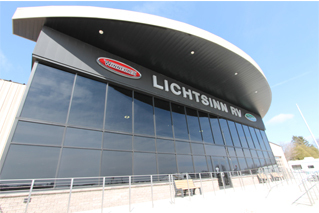 With the team of Lichtsinn employees, we have taken Lichtsinn Motors, with a staff of 13 (GM and RV) and average Winnebago Motorhome sales, to a team of 40 at Lichtsinn RV, in a new state-of-the-art RV facility built in 2014. We have been the largest volume Winnebago parts dealer in the country for the past several years and for the past four years we have achieved the Top Winnebago Dealer in North America award. Kickoff the Summer with Lichtsinn RV’s Summer Road Trip Sale! Kick-off the Summer with Lichtsinn RV’s Summer Road Trip Sale! Select Class B and Class C Winnebago motorhomes are priced to move. See our full Summer Road Trip Sale inventory here. 1. In-Stock Inventory Videos – Our extensive video library is regularly updated with videos of our in-stock inventory both new and pre-owned. These videos are a great way to get an in-depth look and walk-around of several coaches you may be interested in. See our In-Stock Inventory Videos Here. 2. Live Webcasts with Q&A – Each month, the Lichtsinn RV team broadcasts live from our studio one mile away from the Winnebago Motorhome Division in Forest City, Iowa. We cover various topics and take your questions live. See our Live Webcast Archive Here. 3. How-To Videos – Wondering how to set up the auto-gen feature on your generator or maybe your wondering how to operate your Truma Combi control panel… check out our extensive how-to videos where one of our Winnebago Factory Trained Sales Consultants or RVDA Master Certified Technicians can walk you through the steps. See our How-To Videos Here. 4. Product Videos – Do you have a specific product in mind? 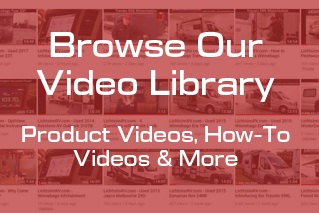 We have an extensive and informational collection of videos on the Winnebago Revel and more! See our Product Videos Here. 5. RV Parts & Accessories Videos – Thinking about adding the Mobileye Collision Avoidance System to your RV? We have videos on that system and more on our RV Parts and Accessories section. See our RV Parts and Accessories Videos Here. 6. RV Service Videos – This section of our website is chock-full of service topics including winterization, de-winterization, orientation videos and more! See our RV Service Videos Here. 7. Product Comparison Videos – Are you debating between a Winnebago product and another brand? We have created a collection of videos that put Winnebago products head-to-head with their competitors to see which product is better. See our Product Comparison Videos Here. See all of these videos and more in our video library here. 1. No Delivery Miles – New RVs from Lichtsinn RV have NO delivery miles nor tow car stress on them. NO one will eat, drink, or live in your new investment or tow their own personal car during the crucial break-in period. Learn More. 2. Lichtsinn RV’s Reviews – Don’t take our word for it, see our outstanding guest reviews on Google and Facebook from people all over the country who make Lichtsinn RV their choice for Winnebago Sales, Parts and Service. Learn More. 3. #1 Winnebago Dealer in North America – Lichtsinn RV has been named the #1 volume Winnebago Dealer in North America by Winnebago Industries for the past 4 consecutive years. Learn More. 4. Half Day Orientation of Your New Coach – A free thorough walk-around of your RV is included with any RV purchase. During your orientation, one of our RVDA Master Certified Technicians will ensure you know how to use your RV by covering each switch, feature, maintenance and warranty item. Learn More. 5. No Hassle Pricing – Our cost efficiencies over other RV dealers allow us to provide up-front, no-hassle pricing. Learn More. 6. Competitive Financing – We work with several national lenders to provide you with the best rate and terms for YOU. All of our loans are conventional and fixed-rate with no closing costs or added points. Learn More. 7. No Additional Fees to Purchase in Iowa – You will pay the tax and license fees in your home state. We help people all over the country with the registration process to make everything as simple as possible. Learn More. 8. Airport Transportation – Many of our guests without a trade-in fly into the Minneapolis/St. Paul (MSP) airport in Minnesota or the Des Moines (DSM) airport in Iowa. Each is only a 2 hour drive from our dealership. We have transportation drivers who will pick you up at the baggage claim. Learn More. 9. Winnebago Factory Tours – While you are here, we recommend you take the Winnebago Industries Factory Tour available April thru November. it is a great way to see the craftsmanship and quality that goes into each and every Winnebago Motorhome. Learn More. 10. Nationwide RV Parts Shipping – We have the LARGEST Winnebago Parts Department in the Country with same-day shipping on in-stock parts. Plus, we offer a 10% discount on Winnebago Parts to all WIT Club Members. Learn More. 11. Electrical Hook Ups On Site – We have FREE electrical hook ups for you to use while you are here for delivery or service. We also have FREE fresh filtered water, dumping facilities, and high-speed wireless internet access. Learn More. 12. RV Service Department – Each of our Factory Trained Service Technicians at Lichtsinn RV has earned their RVDA Master Certification. This certification provides you with the assurance that the technician working on your RV has the specific skills needed to do so. Learn More.